Depot Lights Go Up---Fun Ahead! It's been quiet at the depot since they wrapped up the caboose for winter. But somehow Bob Behal and Don Somers just can't stay away. 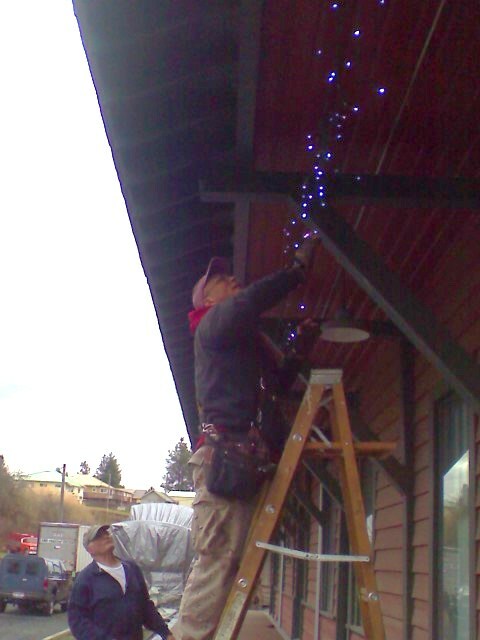 So while other volunteers were out in the Scenic Six Park decorating for Christmas, Bob and Don strung lights at the depot. 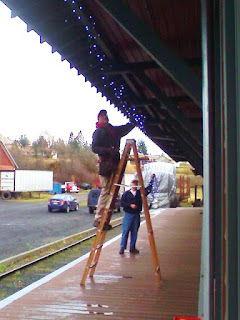 Thanks to HPG board member Hal Van de Vord for the generous donation for the lights. They will be turned on during the holiday season and they will be beautiful. Thanks Bob and Don for furnishing the labor for this project. Speaking of Christmas, Don got the word that the railroad will be hauling Santa into town the day of the Lighted Christmas Parade. Mark December 8 on your calendar because this will be a great event! In addition to the parade and fireworks, there will be a craft fair sponsored by the HPG, with vendors at the Rebekah Hall and VFW on Pine Street. December 8 has a full slate of events, including dog sled races with people pulling the dogs, a chili feed, a concert, and lots of activities all around town. This will truly be an old-fashioned family Christmas, and the HPG will be a large part of the action!